Summary: A new Journal of Neuroscience study reports elevated levels of BACE1, an enzyme associated with neuronal damage in Alzheimer’s disease, were identified in postmortem brain samples of those with HIV. A protein involved in Alzheimer’s disease (AD) may be a promising target for treating neurological disorders in human immunodeficiency virus (HIV) patients, suggests a study published in Journal of Neuroscience of rat neurons and brain tissue from deceased humans. The research shows that the two conditions may damage neurons in similar ways. Although HIV-associated neurological disorders (HAND) and AD have symptoms in common, whether they also share underlying mechanisms of disease progression is controversial because HAND patients do not exhibit the amyloid plaques that are characteristic of AD. To address this question, Kelly Jordan-Sciutto and colleagues investigated the role of a well-known AD protein; β-site amyloid precursor protein cleaving enzyme 1 (BACE1); in HAND. The researchers found elevated levels of BACE1 and Aβ oligomers, the compound thought to be responsible for neuronal damage in AD, in postmortem brain tissue of HIV-positive humans. 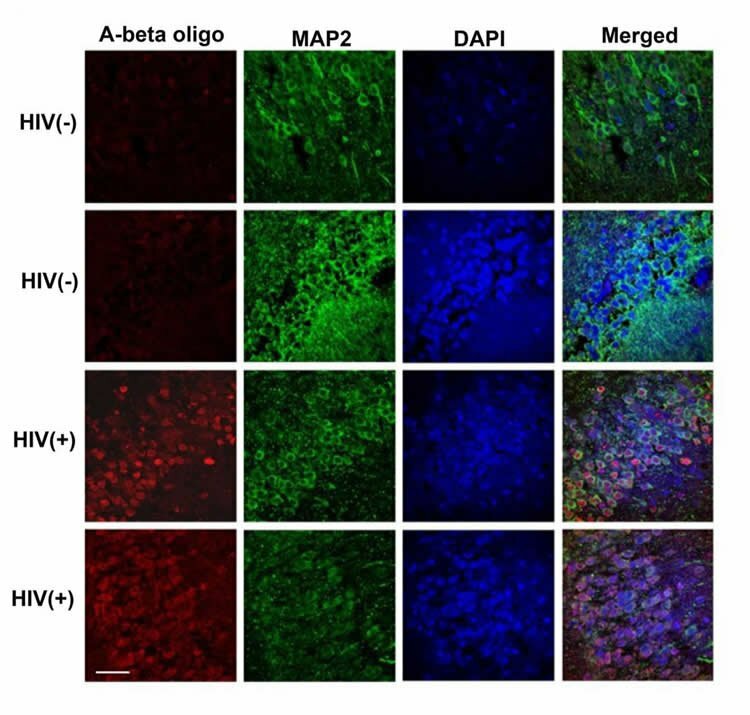 Aβ oligomers are elevated in the brains of HIV(+) cases. Paraffin-embedded tissue sections from hippocampus of HIV(-) and HIV(+) individuals were prepared for immunofluorescent analysis and visualized by laser confocal microscopy. Representative images are shown from hippocampal sections triple-labeled for Aβ oligomers (red), MAP2 (green), and nuclei (blue). Red and green colocalization appears yellow. NeuroscienceNews.com image is credited to Stern et al., JNeurosci (2018). Treating rat neurons with HIV-infected white blood cells from healthy humans revealed similar mechanisms of neurotoxicity. Image Source: NeuroscienceNews.com image is credited to Stern et al., JNeurosci (2018). SfN “Overlapping Mechanisms in HIV Cognitive Disorders and Alzheimer’s.” NeuroscienceNews. NeuroscienceNews, 9 April 2018. SfN “Overlapping Mechanisms in HIV Cognitive Disorders and Alzheimer’s.” http://neurosciencenews.com/cognition-hiv-alzheimers-8749/ (accessed April 9, 2018). HIV-associated neurocognitive disorders (HAND) share common symptoms with Alzheimer’s Disease (AD), which is characterized by amyloid-β (Aβ) plaques. Plaques are formed by aggregation of Aβ oligomers, which may be the toxic species in AD pathogenesis, and oligomers are generated by cleavage of amyloid precursor protein (APP) by β-site amyloid precursor protein cleaving enzyme 1 (BACE1). BACE1 inhibitors reverse neuronal loss and cognitive decline in animal models of AD. Although studies have also found evidence of altered APP processing in HIV+ patients, it is unknown whether increased BACE1 expression or Aβ oligomer production is a common neuropathological feature of HAND. Moreover, it is unknown whether BACE1 or APP is involved in the excitotoxic, NMDA receptor-dependent component of HIV-associated neurotoxicity in vitro. Herein, we hypothesize that HIV-associated neurotoxicity is mediated by NMDAR-dependent elevation of BACE1 and subsequent altered processing of APP. Supporting this, we observed elevated levels of BACE1 and Aβ oligomers in CNS of male and female HIV+ patients. In a model of HIV-associated neurotoxicity in which rat neurons are treated with supernatants from HIV-infected human monocyte-derived macrophages (HIV/MDMs), we observed NMDAR-dependent elevation of BACE1 protein. NMDA treatment also increased BACE1, and both pharmacological BACE1 inhibition and genetic loss of APP were partially neuroprotective. Moreover, in APP-/- mouse neurons, NMDA-induced toxicity was BACE1-independent, indicating that cytotoxicity of BACE1 is dependent upon APP cleavage. Findings suggest that increased BACE1 and resultant Aβ oligomer production may contribute to HIV-associated neuropathogenesis, and inhibition of BACE1 could have therapeutic potential in HAND. HIV-associated neurocognitive disorders (HAND) represent a range of cognitive impairments affecting approximately 50% of HIV+ individuals. The specific causes of HAND are unknown, but evidence suggests that HIV-infected macrophage infiltration into the brain may cause neuronal damage. Herein, we show that neurons treated with conditioned media from HIV-infected macrophages have increased expression of β-site amyloid precursor protein cleaving enzyme 1 (BACE1), a protein implicated in Alzheimer’s Disease (AD) pathogenesis. Moreover, inhibition of BACE1 prevented neuronal loss following conditioned media exposure, but had no effect on HIV-associated neurotoxicity in neurons lacking its cleavage target amyloid precursor protein (APP). We also observed increased BACE1 expression in HIV+ patient brain tissue, confirming the potential relevance of BACE1 as a therapeutic target in HAND.